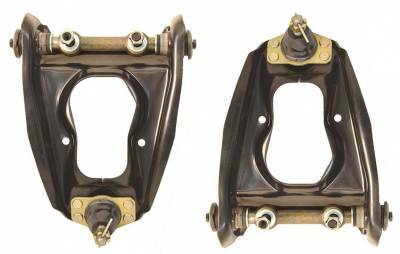 New for 2016 is PST's HD Control Arms for Mustang and many other popular Fords. These are brand new arms that have been redesigned using a rubber control arm bushing with a heavy duty cross shaft. They are a must have upgrade when restoring your classic Ford. This design allows for a comfortable ride as the steel factory type bushings are replaced with rubber to give your car a more modern feel and quieter ride. You will have less maintenance with rubber bushings and no greasing is required. Save time and money with the bolt-in ready control arms. Buy your pair today!